As we were winding down to Turkey-Day, my coworkers and I found ourselves a bit parched. 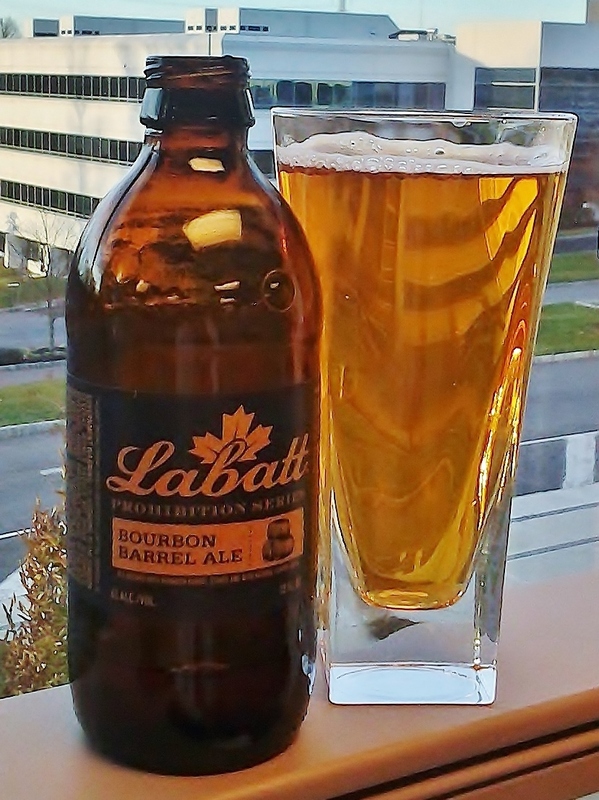 That was soon remedied with an icy cold six of Labatt’s Prohibition Series Bourbon Barrel Ale. Despite the rather long title, this is a move to capitalize on the appeal of aging beer in various types of barrels. We have had a number of beers from Innis & Gunn aged in Bourbon, Irish Whiskey, or Rum barrels as well as Bourbon aged offerings from Anderson Valley, Alltech’s Lexington Brewing, Founders, and Goose Island. So, our experience with barrel aging has been limited to smaller, craftier brewers rather than the largest brewer in Canada and a part of the mighty, brewing powerhouse AB InBev. Labatt’s holds a special place for me as their Blue was one of the first “imported” beers that I ever had and played a big part of my Canadian experience (with Moosehead and Molson Ice) in my not-so-misspent youth. Introducing flavor that’s too big to ban. Our new Prohibition Series is a nod to Labatt’s role in keeping the beer flowing during America’s “dry spell”. The two distinctively bold flavors, Bourbon Barrel Ale and Apple Harvest Ale, transport drinkers back to that exciting era of smugglers and speakeasies. The Bourbon Barrel Ale is robust with a rich, Bourbon flavor and a smooth finish. Appearance: Light amber with a little foam. Aroma: A little malty with a big hit of dough. A little like wet, wheat bread. Taste: A bit out of balance with the beer and the bourbon flavor maintaining a separate but equal profile. The flavors weren’t blended but layered. I think I made a bit of miscalculation as I began to drink the beer right out of the fridge. It was simply too cold and impacted my initial impressions. After I let it warm up a bit, the aromas had far more sugars and spice and far less wet, wheat bread. Once it warmed, this was a very easy drinking beer with some good flavor (I don’t think I would go so far as to call it “robust”) and a nice finish. More importantly, what had been layered flavors blended together once the beer warmed. Still, the Bourbon flavor was too mild and this beer could have used a little more time in the barrel (or oakerators, or however they “aged” the beer). So the verdict is pretty good, but far from great? You take a decent beer and age it a little while and you get to pretty good. If you started with a better beer or aged it for a longer period of time; you might be able to move the needle a bit farther. That’s some sound reasoning right there! And yet, you will find that a fair number of brewers can’t seem to follow it.